Tuesday 23rd August 2016 - a mostly sunny and hot day. 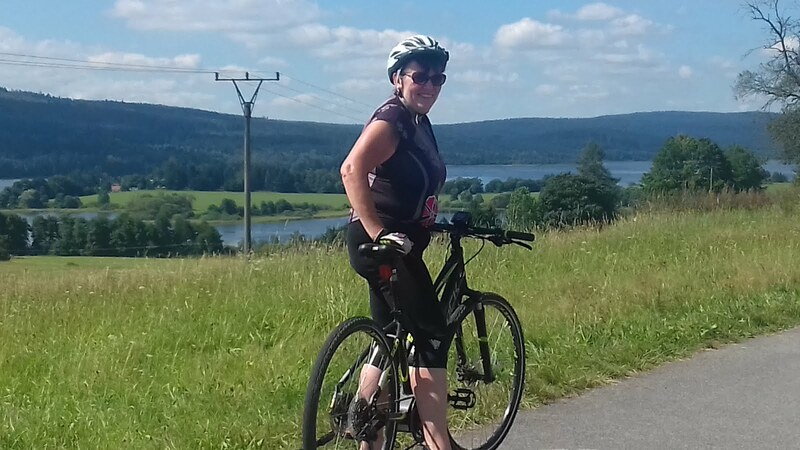 John and I spent today cycling on our own on some of the many miles of lovely, but slightly hilly bike trails that criss cross the Lipno Lake area. 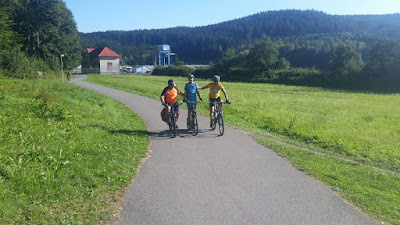 We both agreed, having already visited Lake Constance in Germany, (a place that is quite famous for it’s cycle ways), that this part of the Czech Republic wins hands down - especially if biking is up your street! We left the house and headed for Dolni Vltavice, where we planned to catch a ferry to cross back over the water to complete a circular ride. 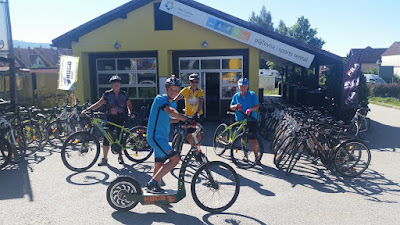 However, as the first half of the ride (about 19 miles) contained all the hills it was quite hard work, and at one point I couldn’t quite figure out why we did this for fun! 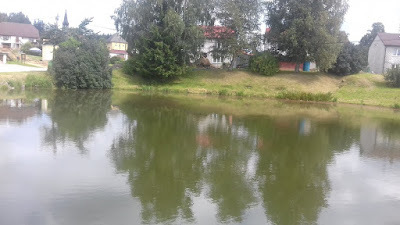 But when we paused for coffee by a little pond, and had the pleasure of watching fish leaping for insects and swallows skimming the water’s surface while trying to catch their lunch, the simple pleasures in life became quite clear. 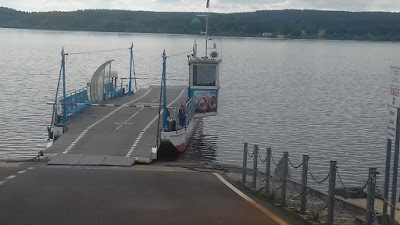 While we waited we had time to learn form the information boards that the lake is man made and forms the largest body of water in the Czech Republic, covering 48,700 square kilometres, and thus earning the title of The South Bohemian Sea. Interestingly it only has an average depth of 6.5 metres but it holds the vast amount of 306 million cubic metres. Now my maths is slightly lacking, but with all of the above info, even I can work out that it must be a very long way all around, so with that in mind, I think we’ve shelved the possible plan to cycle all the way! Once we’d crossed over on the ferry we had about another 15 miles to ride, but with another little rest it really was a very enjoyable ride. Wednesday 24th August 2016 - The weather is still behaving very well and treating us to sunshine for most of the time. Well, today was almost an exact replica of yesterday except for 2 facets! Firstly Sharon Paul and Ben came with us, and secondly I had a very big helping hand that made me zoom up the hills and enabled me to fly past all the others as if jet propelled! 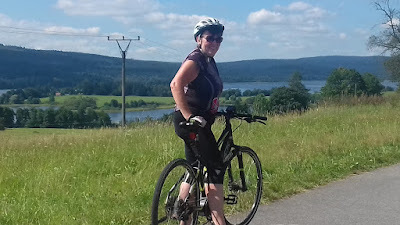 I’d hired an electric bike (just 22 quid for the day) and it was absolutely wonderful - no more huffing, puffing or sweating on the hills and John and I had great fun racing and chasing on the way home. 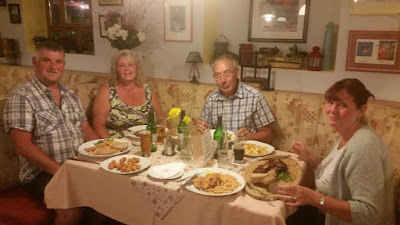 Later we found our way down into the village of Fyrmbuk where we stumbled across a splendid little watering hole where we shared a lovely meal for a bargain basement price - 5 main courses, 4 puds, drinks for all and an extra drop of whisky for John - just about £65 all in! Another quite day at home for us - T4rdis2 got scrubbed inside and out, and everything in site was washed and dried. We spent time lazing in the garden, and we even briefly considered where we might go next. We’re thinking maybe Saxony (in Germany), and hopefully our itinerary will include Dresden, Leipzig and Sachsische Schweiz - The Saxon Switzerland where we're hoping we'll be able to visit the Lusatian Mountains. Friday 26th August 2016 - Absolutely boiling again! Today needed to be a good one because it was our last full one with Sharon, Paul and Ben - so to be sure we all enjoyed it to the full we had sneaked into the hire shop again and secured E-bikes for us girls and an electric scooter for Ben. Now, you may ask ‘ what about our boys’ - John and Paul choose to be brave and go under their own steam and on their own bikes, thus facing the challenge of keeping up with the electro brigade (which they did extremely well), and as an added disadvantage, they had to carry all the food and drink to keep us going all day. 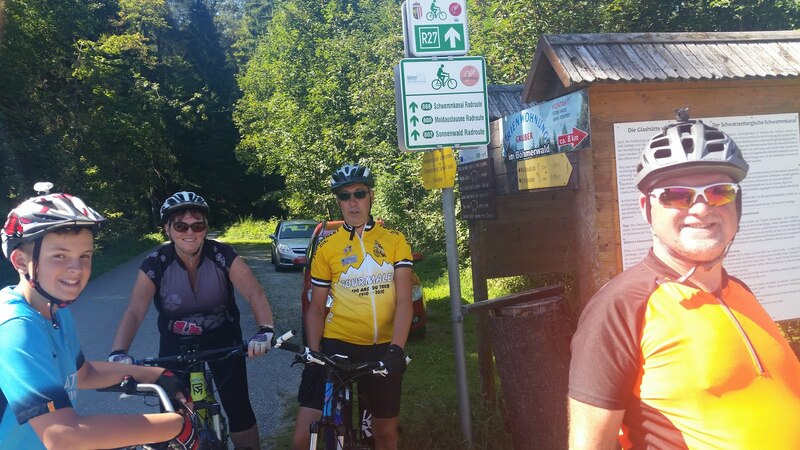 Our other major consideration was where to go, but seeing as we had all enjoyed our ride so much the day before we opted to repeat it but with a little extra excursion into Austria added on - we were aiming for a full day out. So, first things first, and down to the hire shop we went to be kitted out with our shiny electro steeds. Then we were off up the several long hills that form the first part of our ride, and all at a much faster pace that we had done previously - there were a couple of hot sweaty bodies in our party but it wasn’t me or Sharon. Once again we paused at the ferry stop for lunch in the baking sun, and then it was over the water, and from there we attacked the extra loop of our ride which took us very briefly over the border into Austria. This turned out to be Sharon and Paul’s favourite bit as we found ourselves riding over quite gravelled tracks through tall pine woods. 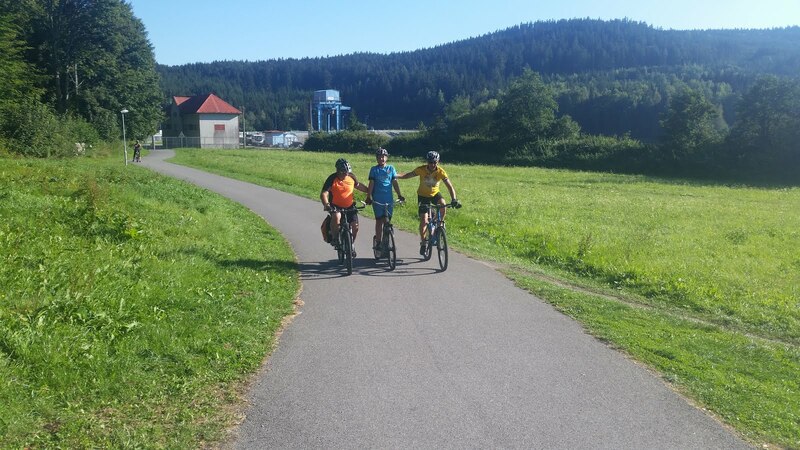 When the extra loop was complete we found ourselves back on a familiar track and we enjoyed a second break beside the lake, before continuing back towards Lipno. Ben under push power from his Dad and John! 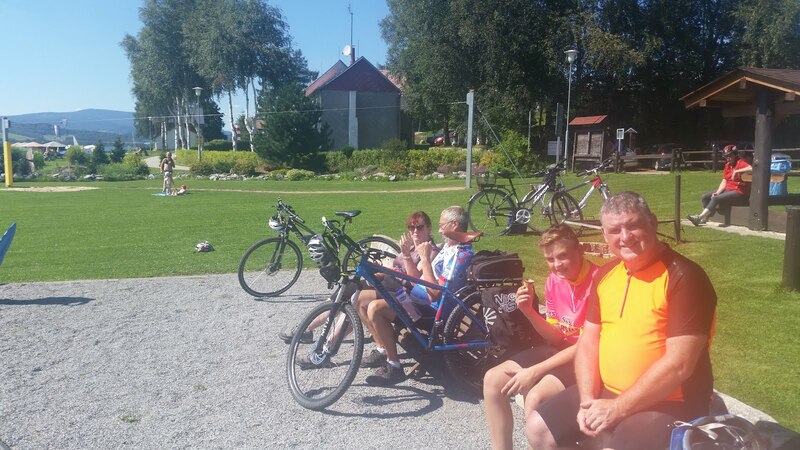 However, it was on this leg of our journey that we encountered 2 small mishaps - Ben’s scooter battery ran out and Sharon’s left peddle got stuck resulting in her only being able to peddle her bike with her right leg - it was a good job her battery was assisting. Happily, the problems were quickly resolved because we were only a couple of kilometres from Lipno where the hire shop had a second business, so we all had our fingers crossed they would resolve things for us. But to get there Ben needed a push and Sharon worked hard at developing the muscles on her right leg! Then it didn’t take much longer (even with an ice cream stop) to get back home where we had the sad job of packing up all our belongings ready for our departure in the morning. This morning brought a quick scurry round gathering up and packing all our belongings, and then a tearful good byes as we went our separate ways. Sharon, Paul and Ben have gone off for a couple of days in Prague before facing their very long drive home, and John and I have returned to Passau just over the border into Germany. So, what do we think of the Czech Republic? When Sharon and Paul suggested it as a holiday venue, we had some reservations as to if we would like it and if there would be enough to do! However, it far surpassed all our expectations and we couldn’t have asked for a more perfect place to spend our ‘holiday’ To say it’s bike friendly would be an understatement - just about everybody rides and it wasn’t unusual to see tots of 3 or 4 riding along side their parents, or people in their 70s or 80s roaming along the tracks. Therefore, we would have to say, that if you want a cheap holiday in a beautiful place with lots to do, and with very friendly mostly English speaking nationals this would maybe be the place for you. It certainly was right for us, and I'm sure, that sometime in the near future, we'll find our way back.